Hoffman’s Chocolates is pleased to announce the re-opening of its store in the Park Sheridan Plaza in Hollywood, Florida. 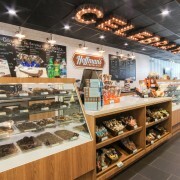 Located at 3341 Sheridan Street, the now open remodeled store features Hoffman’s Chocolates’ fresh new look and feel with signature elements including an updated logo, in-store displays and “Celebrate” theme. The Hollywood store originally opened in November, 2014 and closed for renovations this past summer.